Should anyone come across large trees down across trail or a washout please contact Tucker Garrison 28tuck1@gmail.com or one of the stewards listed below. Scroll farther down for some photographs and descriptions of the trails. The Tshakanawi Trail leads to the foot of Notsi Court, with optional extensions to the Crow’s Nest and the Tree House. Difficulty level: Easy/moderate. 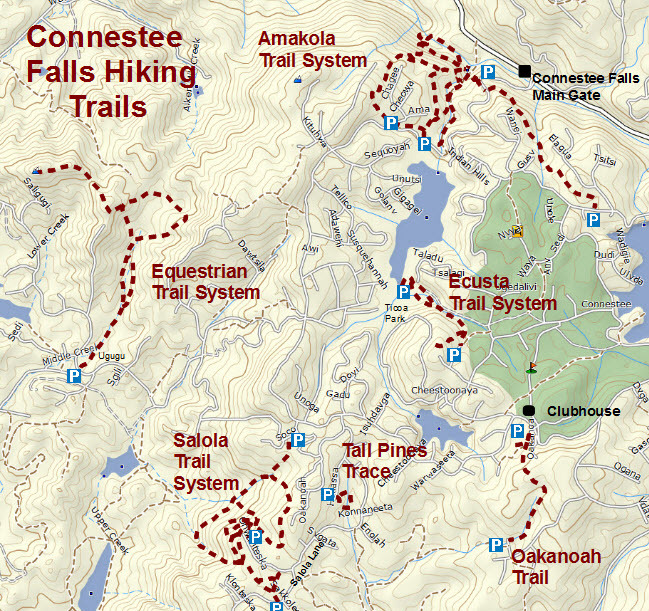 Ecusta Trail is a loop trail that follows the forested shore of Lake Ticoa, turns up a creek with numerous small waterfalls and heavy rhododendron and hemlock growth, then returns across ferny slopes under a light canopy. A lovely walk in the woods! A link connects the Ecusta trail to the RV park located adjacent to the 11th hole of the golf course. The Oakanoah Trail begins at either end of the walking track near the tennis courts and leads up to a large water tower. Just before the water tower are two overlooks with expansive views of the western mountains. Past the water tower the trail ascends the crest of the hill, then descends to follow the bank of a beautiful creek through a rhododendron and mountain laurel thicket. 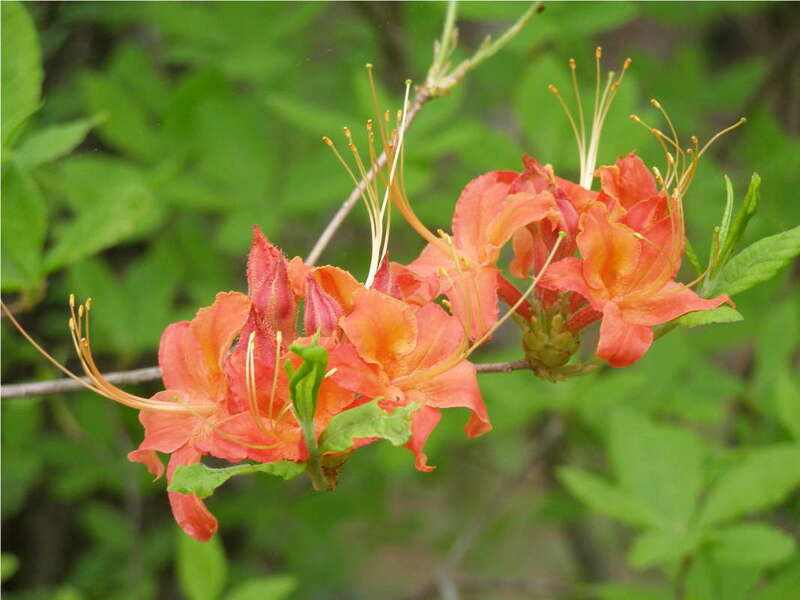 A proliferation of Flame Azaleas bloom along the trail in late May. The Oakanoah Trail ends at Tili Court. Difficulty level: Easy. 1.6 miles round-trip; 220 ft elevation gain. The Amakola Trail features several spur trails. The first spur after the trail head crosses the creek below Upper Batson Creek Falls and connects to the Ogana Trail. 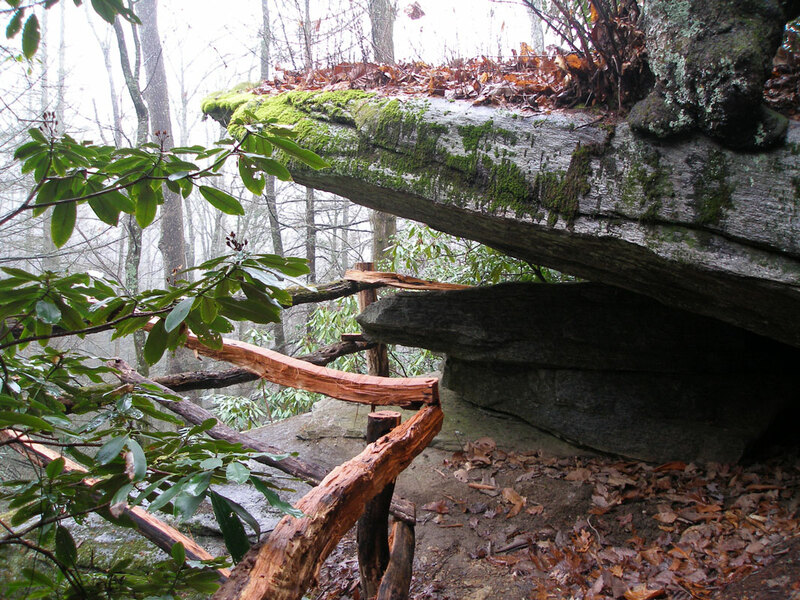 The loop trail to Pisgah View gives a winter view of Mt Pisgah, and the Cave and new Carson Creek spurs have many interesting rock formations. 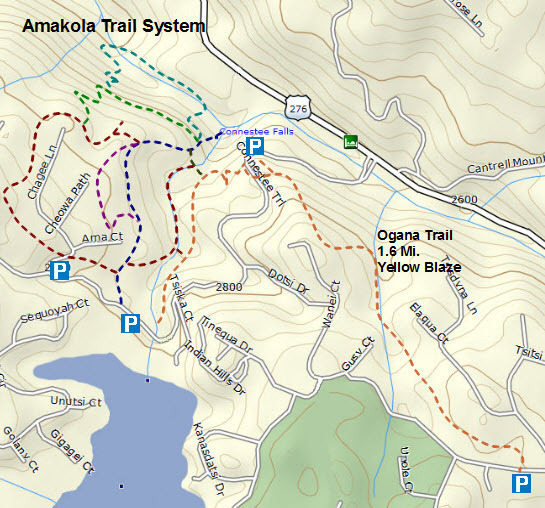 Amakola Trail ends at an overlook that provides an excellent view of Connestee and Batson Creek Falls. Difficulty level: Easy; Moderate where the trail descends to the falls overlook. 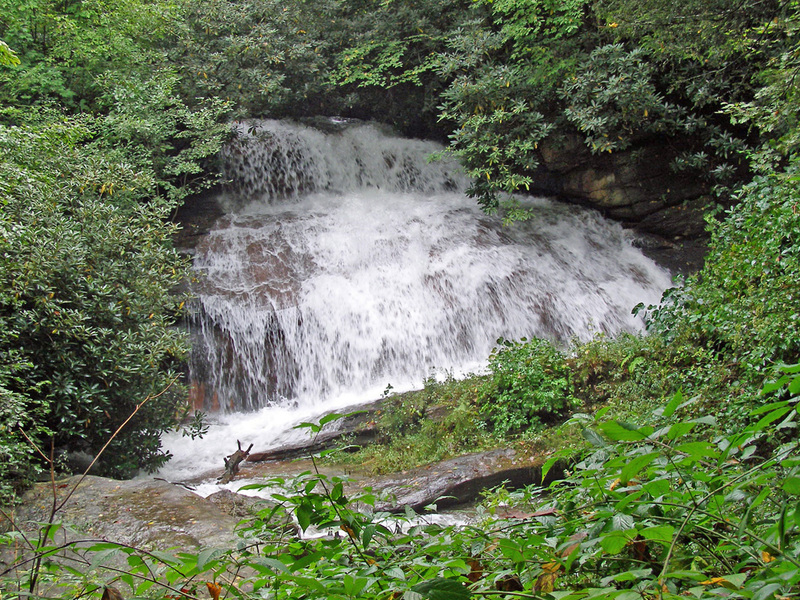 The trail follows Carson Creek upstream from the edge of the Connestee Falls property towards Connestee Falls. 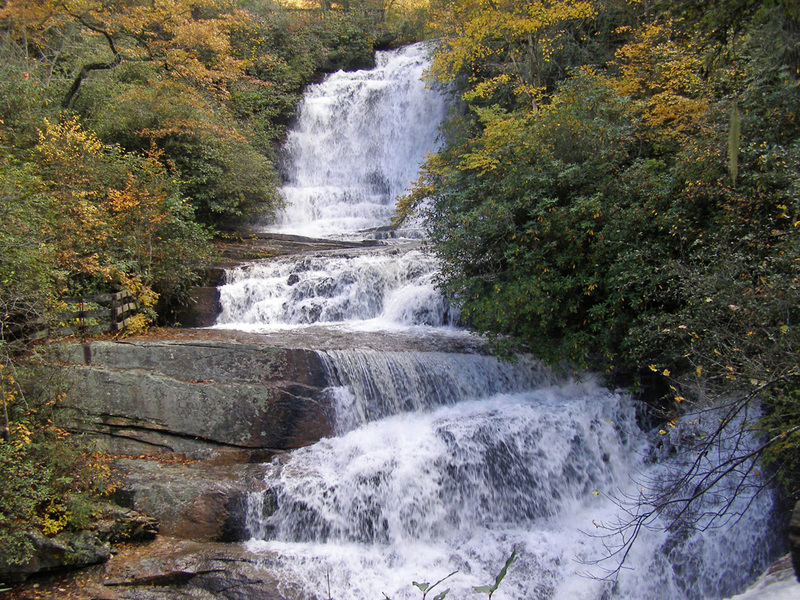 The many cascades can be best viewed by starting from the end of the Cave Trail so that you are facing the cascades and falls as you come up the trail. 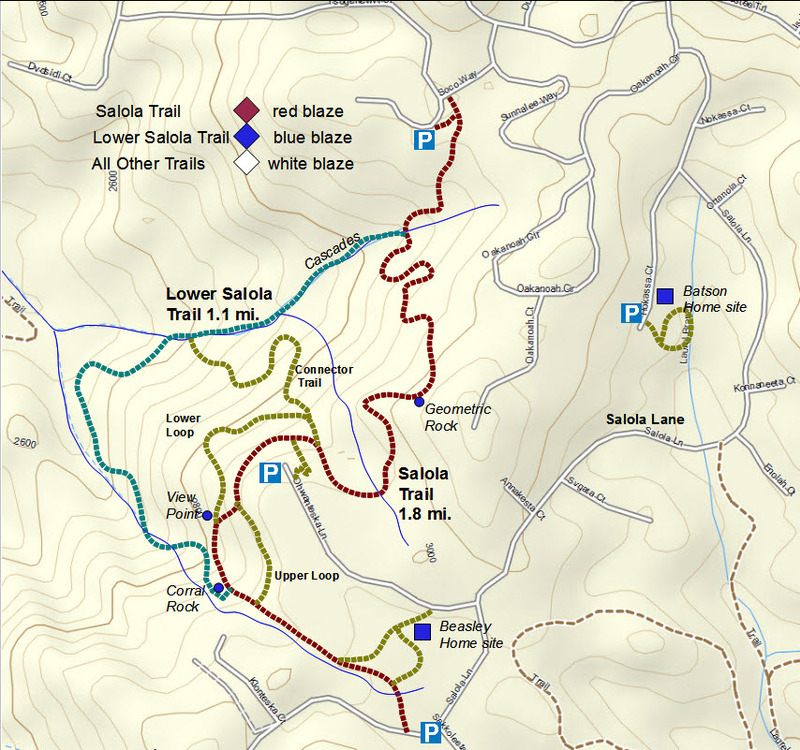 This route will also ensure that the steepest part of the trail is hiked in the downward direction. 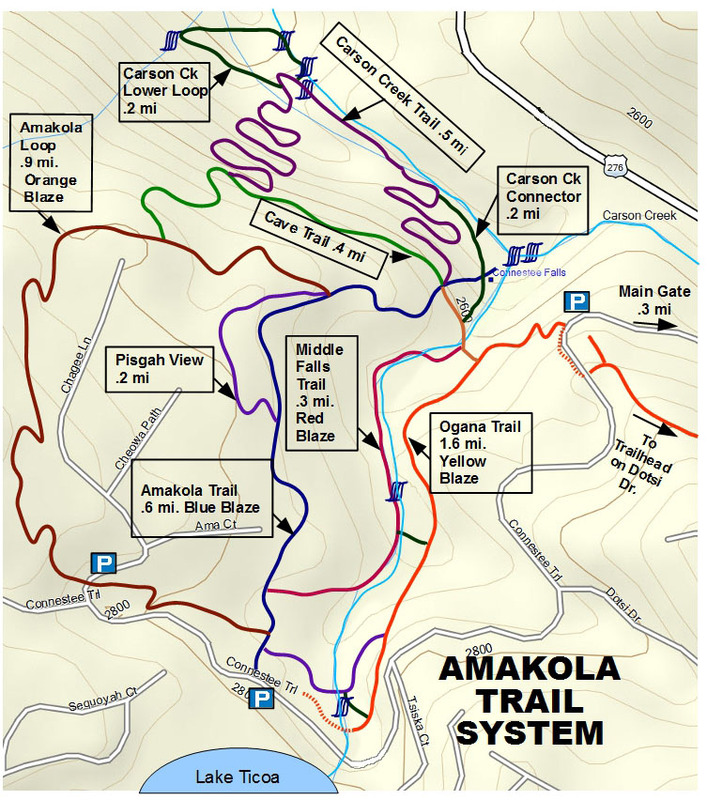 Amakola Loop Trail follows Amakola Brook then crosses Chagee and enters an open forest. Views of the French Broad River Valley and Mount Pisgah can be seen from the area above the cave. 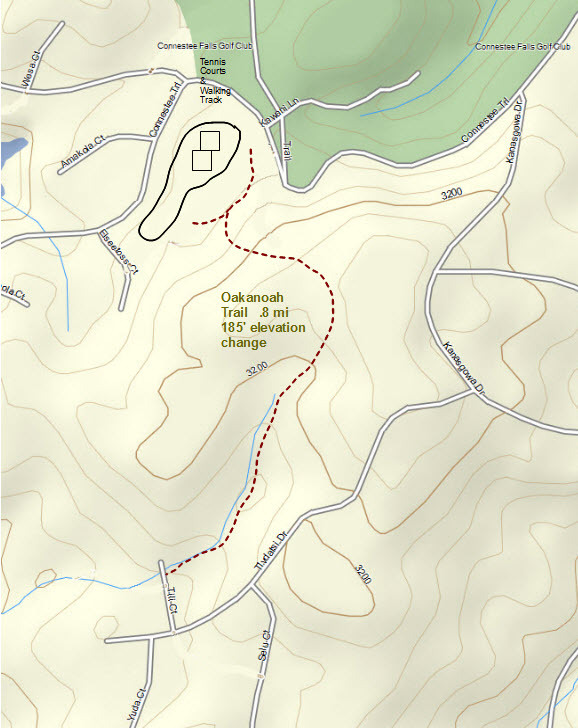 A trail extension connects Amakola Loop directly with the Cave Trail, or you can continue and connect with Amakola Trail near Pisgah View. Middle Falls Trail follows Amakola Brook and Batson Creek. 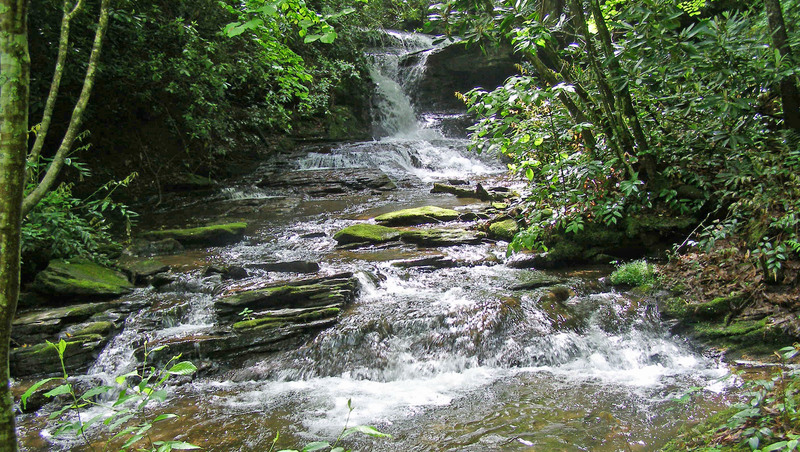 The many cascades and Middle Batson Creek Falls can be best viewed by starting from the Ogana Connector at the north end of the trail so that you are facing the cascades and falls as you come up the trail. Rare Oconee Bells (Shortia galacifolia) and many other native wild flowers grow along the banks of Amakola Brook and Batson Creek. From Ticoa dam, Ogana Trail provides access to a spur trail with a view of Upper Batson Creek Falls. Short connector trails connect to Middle Falls Trail and Amakola Trail. The Grotto features ferns year round and wildflowers in the spring and early summer, with abundant Jack in the Pulpit and Trillium. Ogana Trail continues past the lay by for another mile where it passes through open forest and follows a mountain brook before exiting on Dotsi Drive. 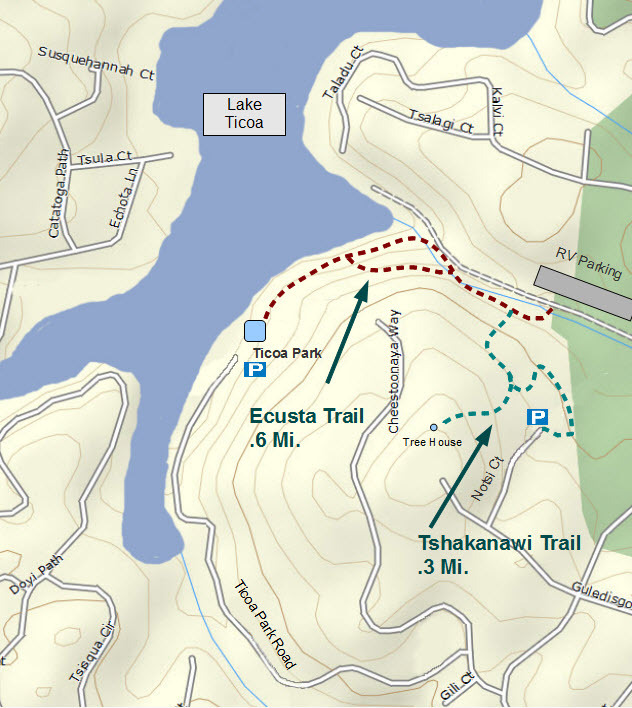 Difficulty level: Ticoa Dam trailhead to The Grotto – Easy. The Equestrian Nature Trail entrance is off Ugugu, across the street from the Equestrian Center. The trail begins on a former logging road that follows along Middle Creek. Signs placed along the trail identify various trees and wildflowers. 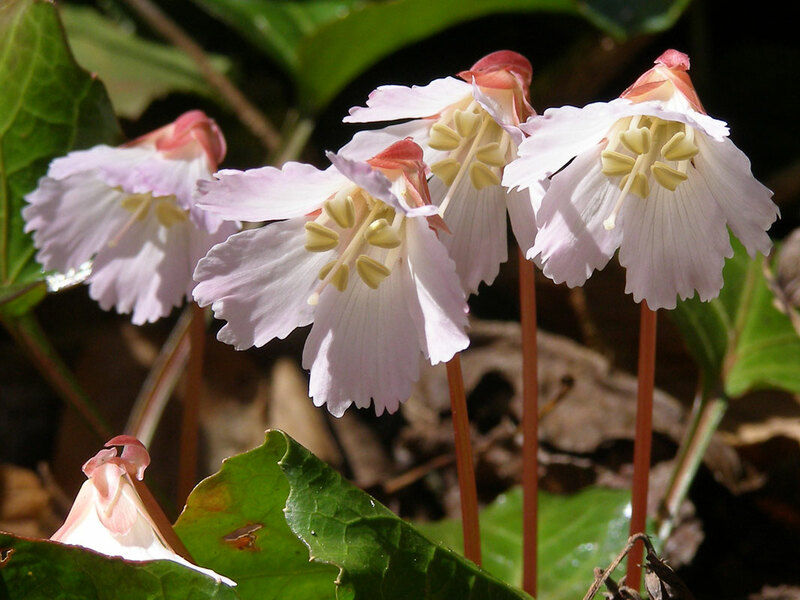 Rare Oconee Bells (Shortia galacifolia) grow prolifically along the banks of Middle Creek. Benches and a picnic table have been placed on the trail to accommodate walkers. Added to the original trail is the Island Trail, which is a favorite spot for seeing trillium, jack in the pulpit, and other wildflowers in spring. At the water tower, Wanteska View Trail continues to Kelley Mountain through an open hardwood forest that provides winter views of Brevard on one side and Lake Wanteska on the other. Difficulty level: First mile – Easy. Mile 1 to Kelley Mountain – Moderate. 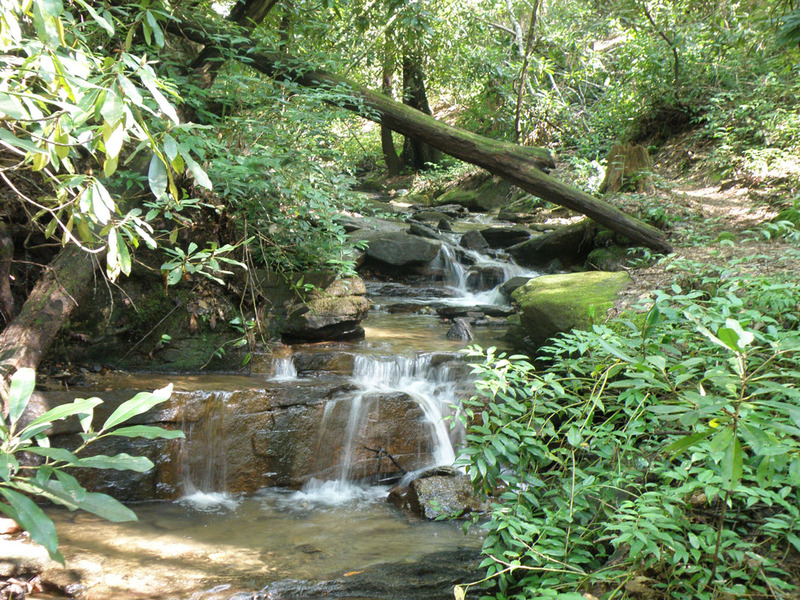 The original Salola Trail meanders through mountain laurel beside a creek. A short detour brings you to the Old Beasley Place Ruins. Shortly thereafter the trail descends through hemlock and rhododendron alongside numerous small cascades. 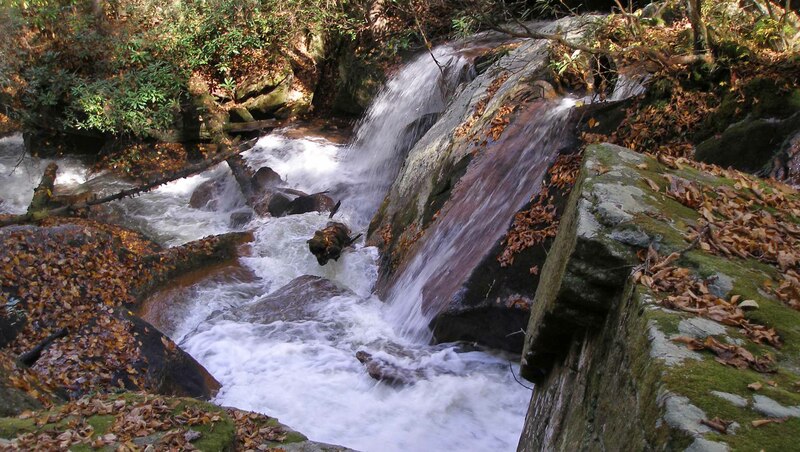 It intercepts with two loop trails from which can be seen a large rock outcropping and stupendous views of Toxaway Mountain and the Hogback. The trail then climbs up through rhododendron and mountain laurel thickets to the end of Ohwanteska Lane. 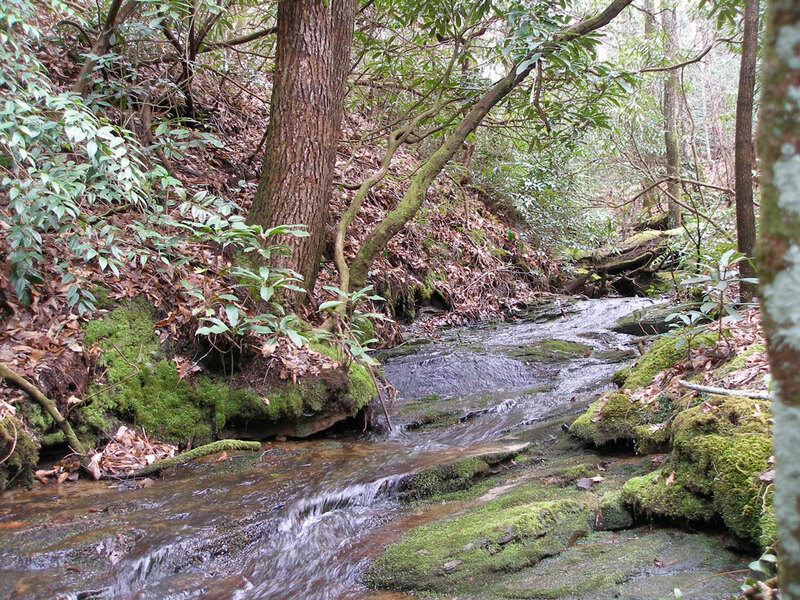 Several additional intersecting loops meander alongside mossy creeks. One extension connects the trail to Soco Way. Difficulty level: Salola Lane to Ohwanteska Lane, Easy. 0.5 miles; 200 ft elevation change. 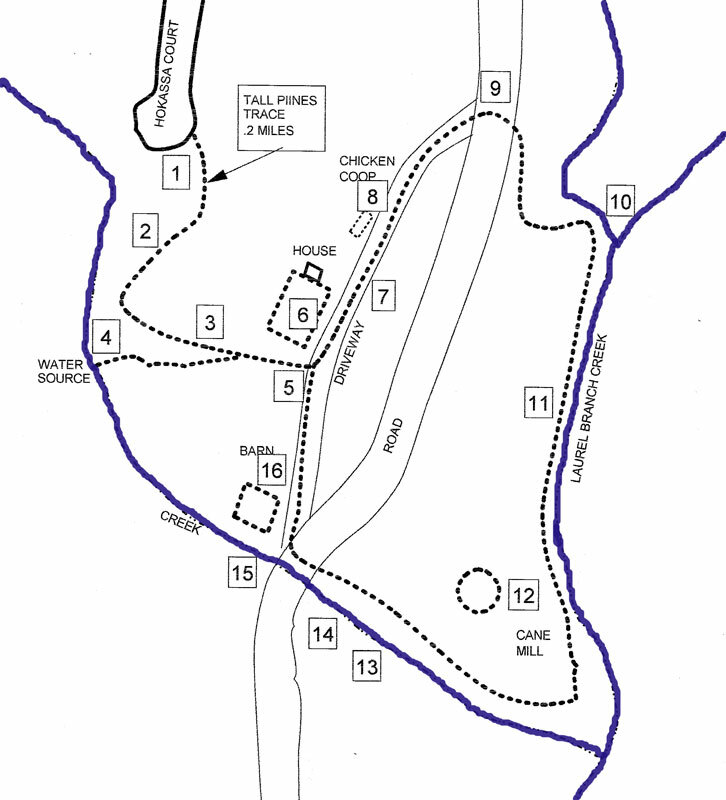 Located at the end of Hokassa Court, Tall Pines Trace leads to the ruins of the Frederick V. Batson home. 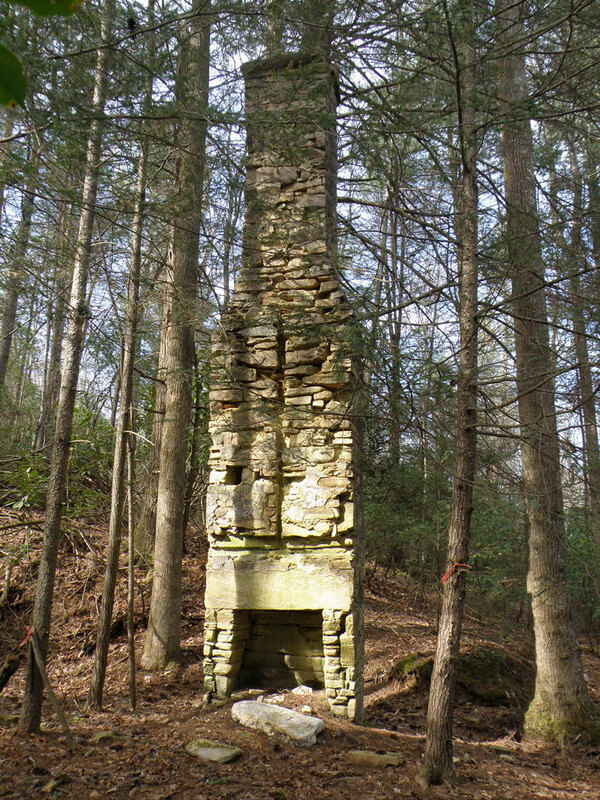 Built around 1910, the stone chimney is all that remains of the house. From the house, the trail continues 0.4 miles through the former Batson farmstead before returning to the trailhead. 1. In spite of the size of the pines, as of 2007, a professional forester estimated their age at 40-years. This land was cleared in 1910, farmed until 1925 and logged in the 1950s. 2. Fred Batson raised crops here, as evidenced by the discovery of a one-horse “Side Hill” plowshare point that was made in Syracuse, New York before 1914. Two of Fred’s main known crops were com and cabbage. 3. This is believed to have been a form of root cellar known as a “bank house”, which is simply a cut into the bank with a wooden enclosure that creates even temperature storage for fruits and vegetables. Fragments of an iron pot and the base of a wood stove were found buried here. 4. This path leads to what is believed to be the Batson’s water source. The creek is too shallow to even permit dipping a bucket, but the small earth dam would have pooled sufficient water for easy collection or bathing. 5. Driveway through the “yard”, providing access to the road in either direction. 6. Site of Frederick Vernon Batson’s 900 square foot two story frame house. Only the stone chimney remains. 7. Stone paved footpath from house to road and lower fields. 8. This area contains several clusters of small locust comer posts arranged in a rectangle. They may be the remains of a small chicken coop. 9. This road connected between Carson Creek Road to the north (along Setsi Lane near Echota Lane, in Qualla Village), and to East Fork Road to the south. At that time Carson Creek Road continued from its current termination all the way to near Connestee’s East Fork gate. 10. 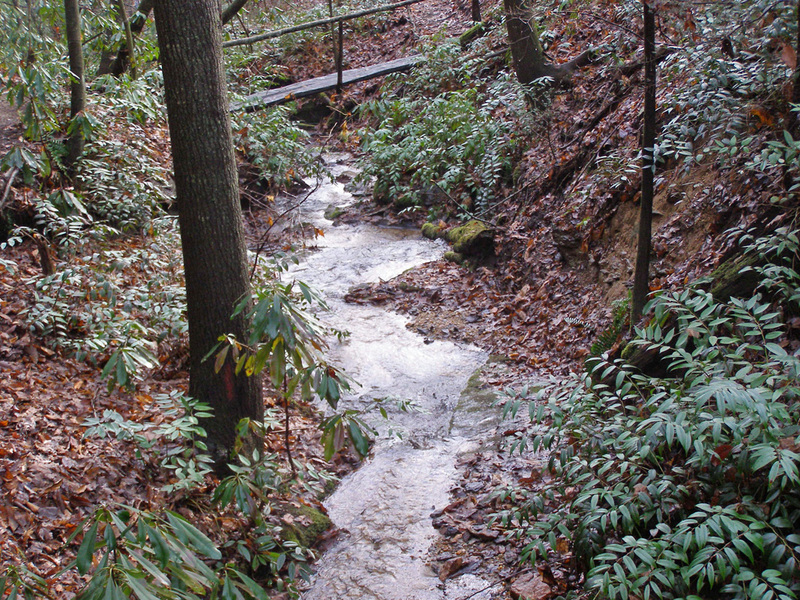 Headwaters of Laurel Branch creek that passes through Frederick Batson’s farm and merges with the East Fork of the French Broad River. 11. Oral history suggests that Fred grew his sorghum cane between the house and the creek, which would include this area. Now club mosses grow here. 12. The Batson’s cane mill would have been in this general area (see plaque), on as flat a spot as possible to accommodate the mule that would have walked around the mill that squeezed the juice from the cane. 13. Old farm road with a ford that crosses the creek. 14. Matching pieces of semi-porcelain dishes were found here, in the creek bed. The porcelain’s markings identify it as being made in Baltimore in the period 1897-to-1904. 15. There was, most likely, a simple log bridge here. This is the continuation of the road that you observed at marker number 9. Traveling south on this road would have taken you to the East Fork Road, near Masters Road.